QOTD: How important is the smoke ring? Yesterday, I wrote that the slice of brisket I had this past weekend at Ronnie's BBQ (Johnson City, TX) was one of the top 5 pieces of brisket I've had. A friend of ours on Facebook commented on the lack of a smoke ring on the brisket. I replied that the ring was faint, at best, but that it didn't matter to me, b/c the flavor and texture were spot on. I've had plenty of slices of brisket with beautiful smoke rings that tasted terrible. If it's dry and chewy, does it matter that it has a sizable smoke ring? So, this begs the question: How important is the smoke ring on a brisket? Saturday's trip to Fredericksburg was great. I was in no rush, it was a nice day to drive, and I hit up 2 joints for the first time (and discovered a 3rd). My plan was to have lunch at just one place, Cranky Frank's in F'burg, but I saw Ronnie's BBQ as I passed through sleepy Johnson City. It was around eleven, and they were already open, so I stopped in. I was already hungry and figured a bite before my planned lunch wouldn't hurt anybody. Ronnie's is a family business. A couple of decades ago, Ronnie Weiershausen turned his convenience store into a BBQ joint, and it's still going strong. In fact, it took 2nd place in KVET's vote for the best BBQ in Central Texas. I had seen Ronnie's before, but I don't think I'd ever passed it when it was open, so I mistakenly assumed it wasn't in operation. Since I had never heard a single word about it from anyone, I had no reason to doubt that it wasn't open. But based on the KVET results, it's a Central Texas favorite, so I was just outta the loop on this one. Not anymore. I loved it. I had a sampler plate of brisket, turkey, pork loin, and pork rib. The loin was just off the smoker (see 2nd picture from the top, below); I had the first piece, in fact. Unlike many pork-loin slices, it wasn't dry. Combine great seasoning on the outside, and it hit the spot. The pork rib was extremely juicy but didn't have much meat on the bone at all. The turkey, again unlike at many places, wasn't dry, though it wasn't as moist as the pork loin. And the brisket: outstanding. My slice had everything I want in brisket: black bark on the outside and an inside that was not dry or chewy but, instead, was moist with rendered fat - but not fatty at all in the sense that I had to separate a bunch of fat from the meat. Unequivocally, the slice I had was among the top 5 pieces of brisket I've had. Ronnie, his wife, his daughter, & the other girl who was working (whom they said might as well be family) were all friendly. My service was great. Ronnie, in the middle of manning the pits outside, took the time to chat with me and tell me the history of the place. It was encouraging to see someone who has been working hard for decades continue to put such effort into his business. It was a surprise stop that turned out to be a fantastic start to my day, and I fully intend to make it a regular stop anytime I pass through Johnson City. 2. Leave a comment below this post. 4. Leave a comment on Facebook. Each gets your name in the hat (a max of 1 time). Do all 4, and your name goes in the hat 4 times. Contest runs through Friday at noon Central. Go! 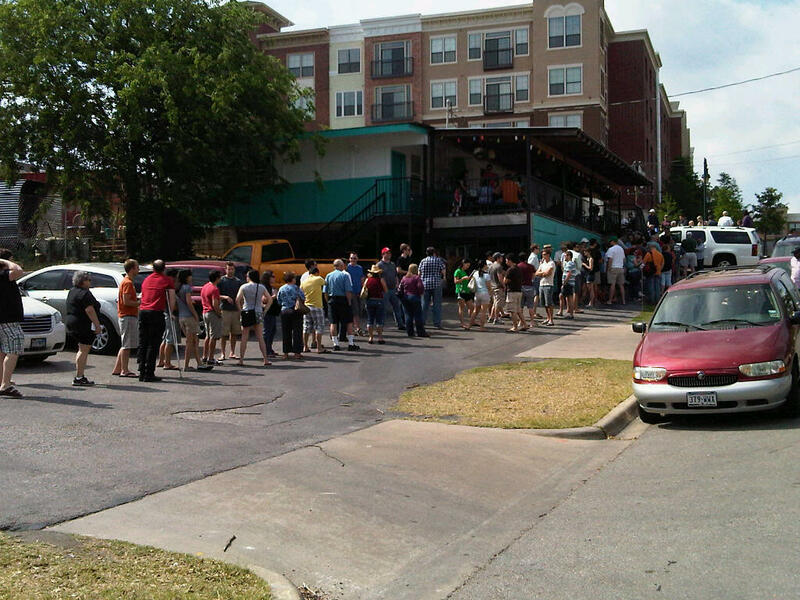 Want brisket from Franklin Barbecue? Get in line. Got this picture via email from a reader. He took the picture 10 minutes before Franklin Barbecue opened on Saturday. He writes, "It took an hour and a half. The brisket was righteous though." Half off at Black's Barbecue (Lockhart, TX)! *REMINDER: All purchases of The Q Card are Buy 1, Get 1 Free through April! Info: The 2011 Real.Texas.Festival. is proud to welcome back the "Taste of Mesquite" BBQ Cook-off for a fourth straight year. Thanks go out to our presenting sponsor, the Mesquite Championship Rodeo, and to our nonprofit partner, the Mesquite Service League, for producing this event. Cooks will compete in three meat categories – brisket, pork spare ribs and one-half chicken – with a total of $2,000 in cash prizes awarded to the top three finishers, including a $500 Grand Champion prize for the cook earning the highest point total. Jackpot beans are also in the lineup, with the winner collecting half of the entry fees paid in this competition. Special awards will be given in three new non-food categories this year: (1) to the BBQ entrant who travels the farthest distance to Mesquite, (2) to the best-dressed cook or team, and (3) to the best decorated barbecue area. The competitors in the cook-off won’t have barbecue for sale to the general public, but festival goers are free to stop by and take a look around. Information regarding the cook-off can be viewed and downloaded from the menus on this page. If you have questions regarding the event, please e-mail bbq@realtexasfestival.com or call the official BBQ contest hotline at 972-216-4119. 1. Railroad BBQ now has a 3rd location in Dripping Springs (other two: Kyle & Manchaca). The DS location took the place of Main St. BBQ, which took the place of Riley's Bar-B-Q. 2. The Peach Pit BBQ in F'burg is now called David's Old Fashioned Pit BBQ. 3. There's a BBQ joint inside a serice station on Hwy. 290 in Blanco County, just across the Hays County line. It's called Friday's, and the proprietor said has been serving BBQ for 40 years. He used to have a catering biz in Austin. One of our interns makes frequent trips to her French homeland. She took this picture last weekend in Paris. She said it was the only BBQ sauce in the grocery store. Pssht. France! Cost: $8 in advance, $10 at the door (Click here to purchase tickets). A portion of ticket proceeds will be donated to the charity of our choice (TBA soon). Format: The event is part contest, part festival. For the contest portion, panels of judges will rate the BBQ sauces that are entered in the contest. There will be two divisions (Fresh & Bottled), with categories for each (tomato mild, mustard spicy, etc.). As of now, more than 60 sauces from 18 states & 3 countries (including the U.S.) have been entered. The judges' panels will consist of invited judges and first-come, first-served purchasers of judges' tickets ($15 each - includes event entry and everything that comes with it). For the festival portion, we'll have lots of vendors (some serving sauce, some serving BBQ, some simply promoting their business), live Texas music (TBA), free cold drinks, and great door prizes. All sauces, food, and drinks are included in the price of admission. Attendees will choose a People's Choice winner from among the sauces served by vendors. Sponsors: We've lined up some terrific sponsors thus far: Barbeques Galore, TexasFood.com, Thomas Saverio Salon & Spa, Taste of the South, BBQSauceReviews.com, Yelp Austin, Beck-Reit & Sons, & Beer Bouquet. Multiple types of sponsorship are available, from paid to in-kind/trade. We hope to line up more sponsors, so if you're interested in getting some exposure to a crowd of BBQ enthusiasts or know of a business who might be, we'd love to hear from you. Get more information & updates via gettinsauced.com, our Twitter page, our Facebook page, and our Facebook event page. K.C. 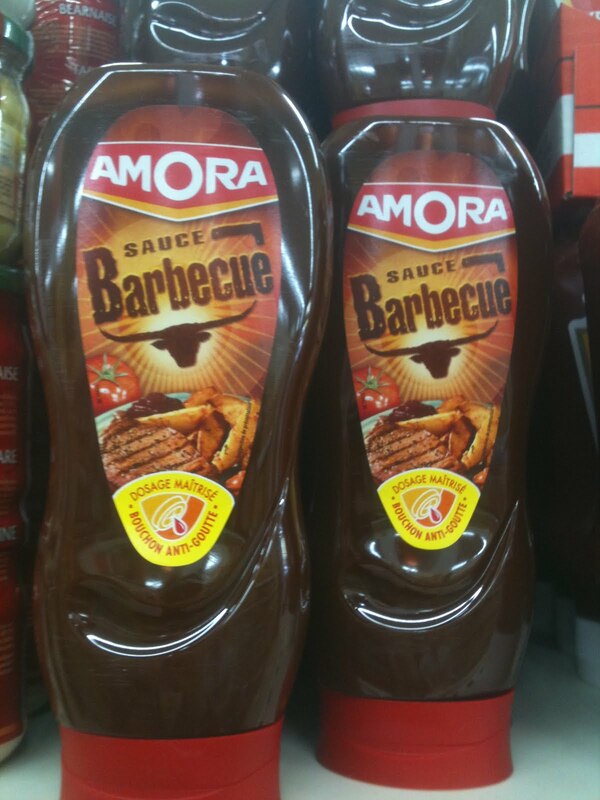 Masterpiece: Master of BBQ Sauces? Reader laments for Goode Co.
QOTD: What's your favorite BBQ-sauce base?